Well, like Donna mentioned in her comment, Sarah Woodham can be a little tedious. She is so right. I love the sampler, but I can only work on it for it so long! I ended up getting Frances Eden out of the wip basket for a change of pace. 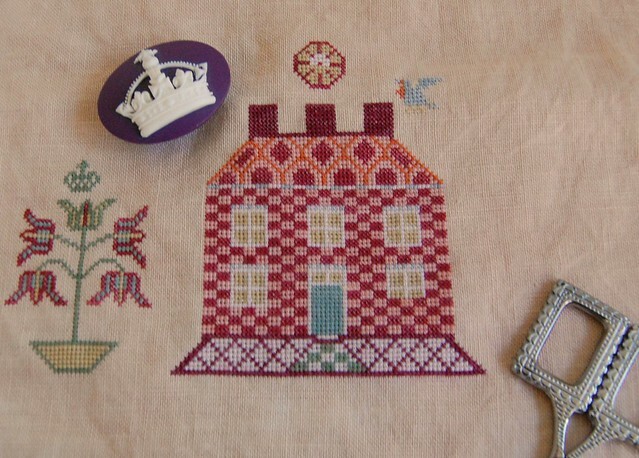 I just love this sampler. The bright colors are so much fun to stitch with! 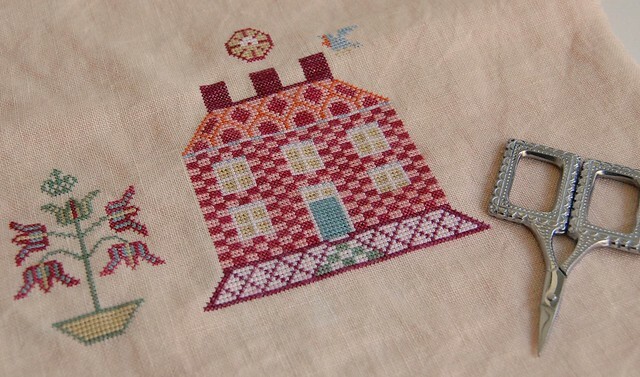 40 ct. Vintage Homespun by Lakeside Linens, Vikki Clayton and NPI silks (1 over 2). Thank you all for your kind words about the transfer. I'm really doing fine. I know we'll get down there eventually. :) Write soon! This is one I would love to stitch!!! Sarah is looking great, I have her kitted and ready to go. Just not looking forward to the over one!!!! Cant wait to see more progress in Frances!!!! You're making me want to pull out mine Nicole. That and start Sarah Woodham. I need to stop looking shouldn't I? Frances Eden is looking great! The colors look so fun! Great in dreary weather. Frances looks great, Nicole! I just love the colors in it--nice and bright. The red would go nicely with Sarah W, I think! Nice progress. Frances is looking great, Nicole !!! I just love the colors.. Bright colors just make is look so alive. I just love her - she is such a bright and fun sampler. Got her waiting the wings ... it makes me want to get her out and start stitching. I love the color linen you chose for her, the colors so far look great. Beautiful! I want to start this one so bad, but know I need to behave myself!!! I just love the bright colors! Beautiful colors and patterns! Love it so far! Frances is such a lovely sampler with all her bright colours. I always love the angels. Yours is looking wonderful - Sandra. I love Frances Eden. I have it on order from the Attic. I love the colors too. Love Frances!!! The colors are gorgeous. Frances is looking lovely - I love the colors, too. Have a wonderful weekend, Nicole. Frances Eden looks beautiful. Sorry to read about the fabric issue.